It is common among Christians that tend to think and believe that the trinity is all over in the Bible. They insist in the belief of the trinity of three co-equal, co-eternal Persons in the One God is the true faith. Many very well-known Bible Scholars do not think Jesus is God in a trinitarian sense, in the New Testament. Many distinguished scholars maintain that the doctrine of trinity is not taught anywhere in the Bible. Let’s now focus and respond to the verses Christians use in defence for their trinitarian belief. We will respond to two verses, which are Matthew 28:19 and 1 John 5:7. Before proceeding any further, let’s first define what the Christian Trinity is. The Father is not the Son, nor is the Son the Father, and the Spirit is not the Son, nor is the Spirit the Father. They are all distinct from each other. Yet there are not three Gods, but One God (this is according to trinitarian Christians). Any human with a sound/sane mind, who is looking for the truth, will see that the Christian doctrine of the trinity is a contradiction to what God Almighty stated in the Old Testament. This kind of doctrine is never taught by Jesus or his disciples and thus contradicts everything what Jesus taught. If Jesus (p) really taught the doctrine of the trinity, how come there is not one verse where he states:- “God is One but in three persons” i.e., something along the lines of, “Father is God Son is God and the Holy Spirit is also God?” Anyone reading throughout the New Testament will see Jesus saying: “Hear, O Israel: The Lord our God, the Lord is one.” Jesus taught Monotheism not Polytheism. If Matthew 28:19 is true, genuine and Jesus did command his disciples to baptize ”in the name of the Father, and of the Son, and of the Holy Spirit.” Why would Peter go against Jesus’s command and Baptize only in His name? Well the answer lies in the Text. The formula of the “Father Son and Holy Spirit” is not part of the original text of Matthew. How do we know it is not part of Text? Well let us turn to the respected Scholars. We have referenced five quotes and all of them agree that Matthew 28:19 formula of the “Father, Son and Holy Spirit” is not the original. The book of Acts is enough to throw away the trinitarian false Doctrine once and for all. We also gave Eusebius who read the verse as “Go and make disciples of all nations in my name”. It is quite clear from all the above scholarly statements that 1 John 5:7 is a forgery, and it originally was not part of Bible but was added. Let us now quote references and see where did the Trinity come from? Is the Trinity in the Bible? 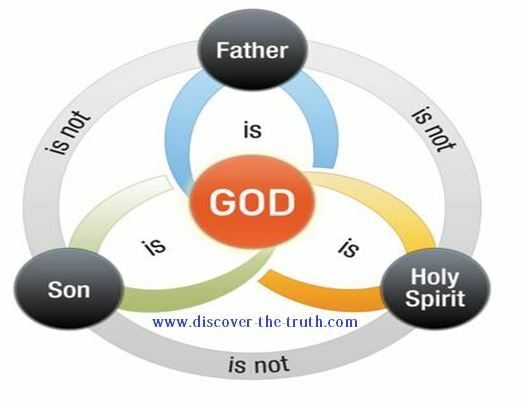 Did the Triune – God formula come from Jesus teachings or someone else i.e. the Church Fathers? MARK 12:29-34 — And Jesus answered him, The first of all the commandments is, Hear, O Israel; The Lord our God is one Lord: And thou shalt love the Lord thy God with all thy heart, and with all thy soul, and with all thy mind, and with all thy strength: this is the first commandment. And the second is like, namely this, Thou shalt love thy neighbour as thyself. There is none other commandment greater than these. And the scribe said unto him, Well, Master, thou hast said the truth: for there is one God; and there is none other but he: And to love him with all the heart, and with all the understanding, and with all the soul, and with all the strength, and to love his neighbour as himself, is more than all whole burnt offerings and sacrifices. And when Jesus saw that he answered discreetly, he said unto him, Thou art not far from the kingdom of God. And no man after that durst ask him any question. Jesus replied, “The most important commandment is this: ‘Listen, O Israel! The LORD our God is the one and only LORD. There is no evidence that I’m aware of that the Matthew 28 verse is a textual interpolation. Scholars in my experience tend to think it is part of Matthews gospel. There are some who say it is an interpolation. They base their evidence on Acts and Eusebius who time and time again when quoting Matt 28:19 it does not have the Father or Holy Spirit. Just quotes “Jesus”, similar to Acts. But, F.P., the issue is that the manuscript evidence does not support a charge of it being an interpolation in specifically the text of Matthew. (1) The triadic formula does appear in Eusebius’ “Letter on the Council of Nicaea” (so too the Didache). (2) I have encountered KJV-Onlyists who baptize simply in the name of Jesus, but that in itself does not mean the triadic formula therefore is absent from the KJV. Let’s assume and agree for now that Matt 28:19 is the original. This verse does not give proof for the trinity though. I’ve dealt with the whole supposed contradiction in the baptismal formula on my blog. This is just the same old nonsense being churned out year after year. Well if you read the following in your research you will find that he does quote Matt 28:19 and he mentions the Father Son and Holy Ghost. Muslims spending so many years trying to find fault and contradiction of scriptures…they are still nowhere closer to finding out. 1st John 5:7 is not about the trinity…Its about Jesus Christ. My question to you is does the bible speak about the Father Son and the Holy Ghost. Where does the Holy Ghost come from? 1. The witness of the Holy Ghost. 2. The witness of the Father. 3. The witness of the Son. Glad you’re not a trinitarian anymore, but there are other contradictions in the Bible besides theological contradictions. If Jesus isn’t God and God Jesus and there two separate beings like the bible says then what other contradictions are there in the bible? Well, I meant other contradictions besides theological ones. For example, the book of Genesis contains two creation accounts. the bible and quran are not compairable i read your page and your trying to pick apart the bible and say the quran is perfect but you know it was writting in 600 ad. so whatever spelling mistakes and translation errors there are or were they could of been fixed by the time your book came out 600 and somthing yrs later. were do you think the quran came from its just a copy of the old testament. Why would another account be given when one was just given in chapter 1? Also, chapter 1 uses the generic term “Elohim” for God, whereas chapter 2 abruptly starts using the name “Yahweh”. This would suggest two different authors. There are, of course, many books written that did not make it into the canon. The books you mentioned are some examples. There are also others that have not even survived. These include the “Book of the Wars of the Lord”, or the “prophecies of Iddo”.